Air Optix Colors provide stunning eye color with outstanding all day comfort and breathability. Ultra Smooth Surface protects the lens from irritating deposits for consistent all day comfort. 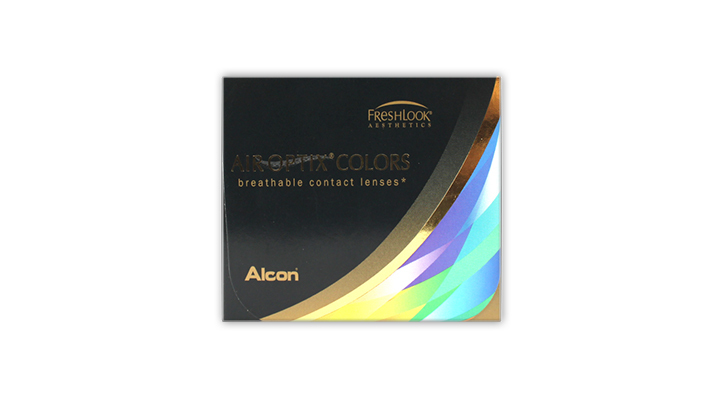 The most breathable coloured contact lens available, for healthy eyes. Made from Silicone hydrogel, they provide six times the level of oxygen to your eye compared to a traditional hydyogel soft contact lens. Unique 3 in 1 technology from Alcon (previously Cibavision), enhances any eye colour for a naturally beautiful and stunning look. Air Optix Colors are available in 9 beautiful colours designed to enhance light or dark eyes, with a completely natural look, whether or not if you are in need of colour correction. If you just want to change your eye colour, but don't need a prescription, just choose 0.00 power when ordering. Each packet contains TWO coloured lenses, in a buffered saline solution. These lenses are designed to be worn for one month or up to 30 times over a longer period for occasional wear, as long as they are properly cleaned and handled. Alcon Labs provide this great Virtual Try On app, so that you can upload your photo, and try on the different colours. Extremely Comfortable! Wish they were more opaque. These are some of the most comfortable contact lenses I have. They are easy to put in, not too thin, but feel like I am not wearing any. I can wear them all day. Unfortunately, I purchased the "Gemstone Green" as my first choice (not here) but could barely tell any color was there. No one noticed unless very up close that my eyes were kind of green. The "Brilliant Blue" is the best for color change, and I found them here at a great price. I was glad I could purchase just one pair, so I could sample them. I found I really like the "Brilliant Blue" as they have the most "pop" that is very noticeable on my medium brown eyes, especially in the sunlight. They are my favorite. The "Sapphire Blue" is also very pretty, more natural and becomes a dark blue on my eyes, which is a nice change. I just didn't care for the gemstone green. I have only tried these colors. They are made very well, but as far as color change I gave them 4 stars. These are the most expensive and the worst performing coloured lenses I have ever bought. The colours on the pictures are not even close to reality, the real colours are very light and do not cover dark iris. My eyes are brown and with grey lenses they are still brown. The other colours I bought - green and brilliant blue also look very light (although I have not tried them yet). I am very disappointed as I hoped for better for this kind of money. I wish I had bought what I always buy (Freshlook colours).